Cattle running on Oakwood, Kandanga Creek, Q. Some of the sires I have used are owned by David Hart whose family own this property. Winter oats on Oakwood; the property runs back into very steep bush. The road into Oakwood showing the type of bush the cattle graze. Well broken weaners and a team of clever dogs are essential for the efficient running of the property. David's dogs on the banks of Kandanga Creek. Emma Zeimer playing with some pups followed by Kahlua. 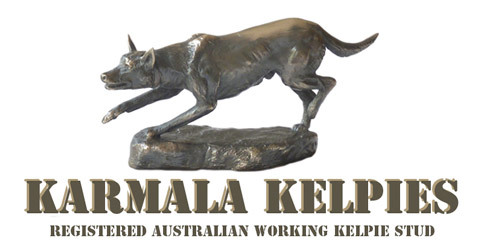 Karmala Kelpies are bred from old bloodlines concentrating on clever mustering dogs, and I have gone to considerable effort to source sires who have worked in difficult country where brains and stamina are essential. This would have been so much harder without the unfailing generosity of David Hart, who has been kind enough to make his sires available. His dogs have worked some of the most difficult country in Australia and any who live up to his high standards are certainly worth consideration; I have benefited greatly from his experience with various lines of dogs. We both, coincidentally, began breeding along much the same lines over a decade ago. Emphasis is put on a friendly, calm temperament, natural working ability and sufficient strength. The dogs are of good type, fed a raw diet for future soundness, and bred carefully to avoid known health problems as much as possible. The stud has been based in Queensland for over fifteen years. The raised kennels are moved around to catch morning sun in winter, and summer shade. A big treed run where the dogs spend their days is below the kennels. Pups are raised in grassed yards. Photo taken from my deck.